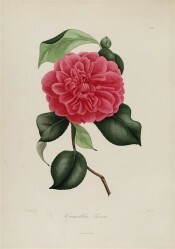 A cultivar of Camellia japonica L. ‘Rossii’ is a seedling of ‘Anemoniflora’ with deep red flowers, the petals finely veined. [ICR, FC p.186/1835]. ‘Leaves large, ovate-lanceolate, curled, recurved towards the stock, very dentate, of a full green; bud with green scales; flower double, three inches in diameter, of a fine cherry-red, No.4, sometimes spotted. – Very beautiful.’ [Berlèse Monography p.80/1838]. ‘This is a very fine variety, and was raised by the late Mr. Wm. Ross, of Stoke Newington, who was an unassuming and ingenious cultivator, and one of the first persons who obtained new varieties of these particular plants from seed. It possesses the valuable quality of lasting for a very long time before it fades: the flowers are moreover of a noble size, and rich colour, and being freely produced, it is doubtless one of the most desirable kinds.’ [LBC no.1707/1833]. Berlèse Iconographie vol.I pl.81/1841. Obtained from Loddiges’ Nursery. Macarthur reported to them on 6th January 1845 that ‘Rossii’ was one of only a handful of plants in the latest importation likely to die [MP A2933-2, p.28]. It was only listed in the 1845 and 1850 catalogues.